I have been trying to work more fish into our weekly rotation. It’s been a little tricky mainly because I rely on my freezer a lot and to incorporate fish into a meal, I really need to pop out and buy some fish the same day I need it. Tiny little violins, I know, I know… But if you could see me try to get any amount of children into a fish store, or really any store, you would understand my hesitation. I also confess to being a seafood snob. I grew up near the ocean and was able to get fresh, fresh, fresh fish or lobsters or clams or oysters whenever I wanted. Spoiled! Every summer, I take my kids back to my hometown and our weekly meals are completely turned upside down. We get to eat as much seafood as we can get our hands on. This simple panko crusted cod recipe is like a little teaser for us as I prepare to pack up my kids and head north to visit my family. This panko crusted cod recipe is easy to make and your family will love it at lunch or dinner. The best part is that it requires only a few ingredients … your favorite mustard, cod (or another white fish), and panko breadcrumbs. I have been loving the gluten-free panko breadcrumbs from Ian’s. I usually get the Italian seasoning flavored version or I buy plain and season them myself. You can get panko breadcrumbs at most grocery stores. 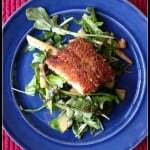 The trick to a crispy layer on your fish is to let it cook! Don’t be tempted to overflip the fish or keep poking at it to see if it’s done. Each side needs about 5 minutes to cook. Commit to not touching it for at least 5 minutes on the first side. For the best looking presentation, cook the non-skin side first because that is the side that you will see on your plate. Once you slide your spatula under the piece of fish to flip it, there’s no going back. Be happy with how much that side has cooked, admire your crispy panko coating, and let the fish continue cooking on the other side until it has cooked through. You can gently check your fish with a fork to see if it is cooked as well as you like it. 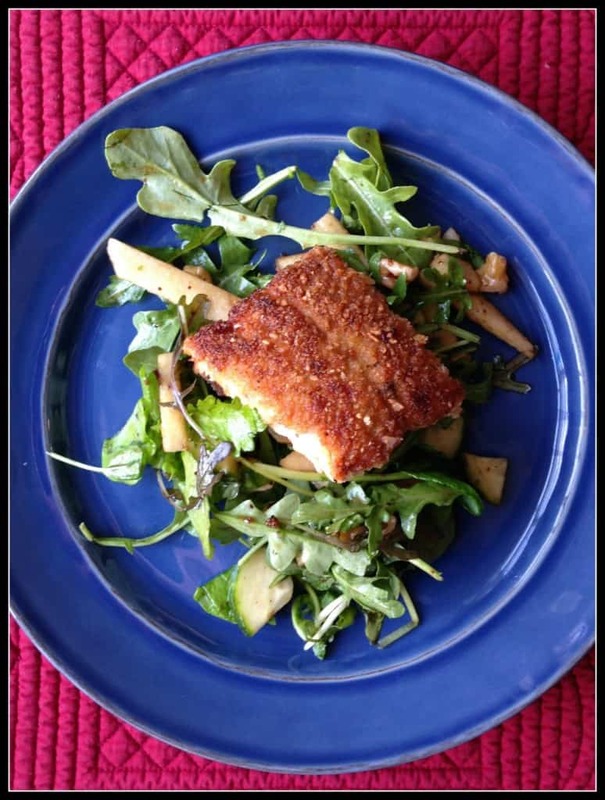 We like to serve our crispy panko crusted cod over a bed of arugula with a balsamic vinaigrette dressing. To make it a more substantial meal, roast some fingerling potatoes to accompany it. Enjoy! Quick and easy fish recipe - perfect for dinner or lunch! Pat cod filets dry and salt and pepper each side. Spread about 1 to 2 tablespoons of your favorite mustard on each side of the fish. Evenly coat each side of the cod with panko breadcrumbs. Coat the bottom of a heavy-bottomed pan with canola oil or a combination of olive oil and butter. Heat to medium-high and quickly put fish top side down in the hot oil. Let the fish cook at medium to medium high heat for about 5 minutes. Carefully slide your spatula under the fish and gently turn it over. Cook for an additional 5 minutes until the fish is cooked through. Serve over a bed of greens or with your favorite veggie sides! Enjoy! This looks fantastic, perfect for summer! Thanks! Love anything over salad in the summer! This is my kind of fish recipe! I love that simple placed it on a lovely arugula salad! Thanks, Pam! The bite of the arugula is a nice contrast! We love fish, and I bet that crunch from the panko is amazing! So good! And I have been so excited to find the gluten-free panko from Ian’s! Nice crunch! Love the simplicity here! Definitely going to be on the rotation next week!!! Cod is one of my favorites and I think my kids would go for this preparation – thanks for sharing! I can’t always get cod in North Carolina so I try to get my fill of it while I am up in Massachusetts!